This issue begins in Japan, circa 1373. We see a lone figure traversing the plains, a huge Samurai. The imposing warrior enters a village and is quckly granted permission to see the lord within. We soon see that the Samurai is a monstrous lizard-man named Chote. He is greeted coldly by his master, an equally large fellow decked out in Samurai armor and a horned mask. The lord demands to know why the the lizard is so tardy. Chote explains that he was beset by Oraga’s men and held up. The reptilian warrior also tells his master that Oraga has many allies, but his mind is in constant turmoil. The Samurai Lord laughs wth this news, congratulating himself for his successful magic. The Master muses that while his magic is weak, he will use every last bit of it to wrest the secret’s from Oraga’s mind. Cut to present day Massachusetts. Donatello and Raphael are playing Scrabble, but Don’s patient and thoughtful playing is annoying Raph (of course). Soon enough problems arrive as Master Splinter, Leo and Mike discover the body of Hattori, the man that was featured in TMNT #9, collapsed in their living room. Raph is enraged at Mike for letting Hattori slip by him, but Leo reminds the tempermental terrapin that Hattori has the skill and knowledge of generations worth of Gosei Samurai within him, thus he could have evaded any of them. Raph is doubtful of this theory. The guys sit their friend in a chair and he soon regains conciousness. As Hattori gathers his wits, he explains that the Gosei Legacy he received has unhinged his mind. Splinter acknowledges that the man’s grandfather feared that he would not be ready to handle the transference of the Gosei Spirit, but they’d had no choice but to bestow it upon Hattori. Master Splinter then probes the fellow’s mind to see what is troubling him, and discovers the Samurai Lord – who has somehow managed to change history. The Sensei states that while he doesn’t know what this evil presence has planned, he does know that the only solution lies in visiting the source, back in fuedal Japan. As the TMNT ponder how they can travel back in time to help their friend, Renet shows up. The Time Mistress explains that the deeds being done by the Samurai Lord of the past are affecting Hattori now. The chipper time hopper then explains that she’ll take the Turtles back in time to fix the temporal mess that’s being created. Splinter states that he’ll stay behind to take care of Hattori, and the Green Team and Renet head back in time. 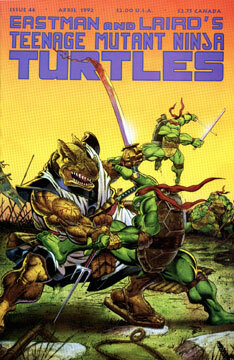 As soon as they arrive, the TMNT find themselves near a barbaric battle, as Chote slaughters some of the Gosei Samurai. Raphael instantly enters the fray and his brothers rush to assist him, turning the tide of the fight. Chote flees and the Samurai leader, Toraga, confronts the Turtles, demanding to know what sort of magical beasts they are. Leonardo explains that they are not magical, but ninjas. This news does not please Toraga, but he thanks the TMNT for their help. Leo tells Toraga that the Turtles have been sent by their Sensei to help the Gosei master, but the Samurai captain states that it may already be too late. Later, Chote is back at the Samurai Lord’s village, and he beseeches his master to flee before the Gosei discover his location. Chote then tells his leader of the four Turtles and their golden haired companion. This news enrages the magician and he strikes his reptilian servant, commanding him to bring back the TMNT and Renet to him… alive.